What are hives (urticaria) and angioedema? What do hives look like? What causes hives and angioedema? Are hives contagious? Does stress cause hives? What are the different kinds of hives? What are the signs and symptoms of ordinary hives? What are the risk factors and causes of ordinary hives? What are the causes of chronic hives? Are there conditions or other causes that mimic hives? How do health care professionals diagnose and evaluate chronic urticaria? What are hives treatment options and home remedies? What is the prognosis of hives? Although hives are very common, their cause is often elusive. Hives typically are not associated with long-term or serious complications. Hives (medically known as urticaria) appear on the skin as wheals that are red, very itchy, smoothly elevated areas of skin often with a blanched center. They appear in varying shapes and sizes, from a few millimeters to several centimeters in diameter anywhere on the body. It is estimated that 20% of all people will develop urticaria at some point in their lives. Hives are more common in women than in men. One hallmark of hives are their tendency to change size rapidly and to move around, disappearing in one place and reappearing in other places, often in a matter of hours. An individual hive usually lasts no longer than 24 hours. An outbreak that looks impressive, even alarming, first thing in the morning can be completely gone by noon, only to be back in full force later in the day. Very few skin diseases occur and then resolve so rapidly. Therefore, even if you have no evidence of hives to show the doctor when you get to the office for examination, the diagnosis can be established based upon the accurate recounting of your symptoms and signs. Because hives fluctuate so much and so fast, it is helpful to bring along a photograph of what the outbreak looked like at its most severe point. Swelling deeper in the skin that may accompany hives is called angioedema. This swelling of the hands and feet, as well as the face (lips or eyelids), can be as dramatic as it is brief. Hives appear when histamine and other compounds are released from cells called mast cells, which are normally found in the skin. Histamine causes fluid to leak from the local blood vessels, leading to swelling in the skin. Hives are very common and are not considered contagious. Although annoying, hives usually resolve on their own over a period of weeks and are rarely medically serious. Some hives may be caused by an allergic reaction to such things as foods, infections by different organisms, medications, food coloring, preservatives and insect stings or bites, and chemicals; but in the majority of cases, no specific cause is ever found. Although people may find it frustrating not to know what has caused their hives, maneuvers like changing diet, soap, detergent, and makeup are rarely helpful in preventing hives unless there is an excellent temporal relationship. Since hives most often are produced by an immune mechanism, the condition is not contagious. 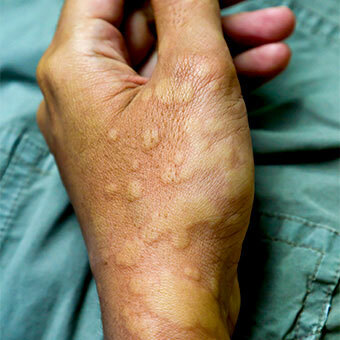 If an infectious disease were the cause of hives in a particular person then it is possible, but not likely, that an infected contact could develop hives. Having hives may cause stress, but stress by itself does not cause hives. Hives fall into two categories on the basis of the time they have been present: acute urticaria (ordinary hives, which resolve after six to eight weeks) and chronic idiopathic urticaria (that continues longer than six to eight weeks). Since hives are so common and acute urticaria, by definition, resolves spontaneously, physicians do not generally expend much time or expense to evaluate the cause of hives of less than eight weeks' duration. Symptoms of ordinary hives flare up suddenly and usually for no specific reason. Welts appear, often in several places. The welts may be skin-colored, pink, or red, and they flare, itch, cause swelling, and go away in a matter of a few minutes to hours, only to appear elsewhere. This sequence may go on from days to weeks. Most episodes of hives last less than six weeks. Although that cutoff point is arbitrary, cases of hives that last more than six weeks are often called chronic hives. As noted above, many cases of ordinary hives are "idiopathic," meaning no cause is known. Others may be triggered by allergic reactions or viral infections. 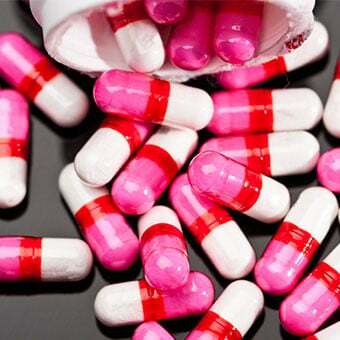 A few may be caused by medications, usually when they have been taken for the first time a few weeks before. (It is less likely for drugs taken continuously for long periods to cause hives but certainly not impossible.) When a medication is implicated as a cause of hives, the drug must be stopped, since testing is rarely available to confirm the cause. In most cases, drug-induced hives will go away in a few days. If a drug is stopped and the hives do not go away, this is a strong indication that the medication was not the cause of the hives. Some medications, like morphine, codeine, aspirin, and other nonsteroidal anti-inflammatory drugs (NSAIDs, such as ibuprofen [Advil]), cause the body to release histamine and produce urticaria through nonallergic mechanisms. People with urticaria should avoid these medications. Despite the reputation of hives being an "allergic" condition, there is often no obvious connection to any provoking substance. In this situation, random allergy testing is not usually helpful. If you know what is causing your hives, then avoiding the cause, if possible. Chronic hives (defined as lasting six weeks or more) can last from months to years. The evaluation of this condition is difficult, and allergy testing and other laboratory tests are only occasionally useful in such cases. The accurate evaluation of this condition requires the patient to give his or her physician precise information regarding their complete medical history, personal habits, and oral intake. Occasionally, it may be necessary to limit specific foods or drugs (potential allergens) for a time to observe any affect upon the skin condition. Certain systemic diseases and infections, including parasitic infestations, may occasionally present in the skin as hives. If an inciting cause can be determined, then specific treatments for that condition ought to be effective, or in the case of food allergies or drug allergy, strict avoidance would be necessary. There are additionally rare forms of chronic urticaria that are produced when the patient makes antibodies against molecules on the surface of their own mast cells. There are tests available to identify this type of hives. 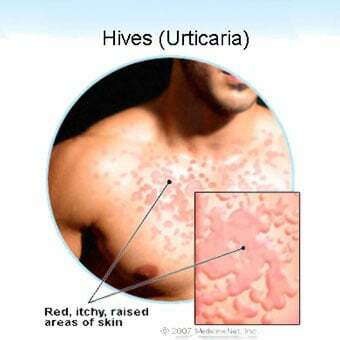 Physical urticaria (for example, heat hives) is a type of chronic urticaria produced by physical stimuli. Common environmental provocations such as sunlight (solar urticaria), water, cold, heat, exercise, and pressure occasionally induce hives. Dermatographism, which literally means "skin writing," is a common cause of physical urticaria. This is an exaggerated form of what happens to anyone when their skin is scratched or rubbed; a red welt appears at the site of the scratch. In dermatographism, raised, itchy red welts with adjacent flares appear wherever the skin is scratched or where belts and other articles of clothing rub against the skin, causing mast cells to leak histamine. Another common form of physically induced hives is called cholinergic urticaria. This produces hundreds of small, itchy bumps. These occur within 15 minutes of exercise or physical exertion and are usually gone before a doctor can examine them. This form of hives happens more often in young people. There are other rashes that may look like hives, but the fact that they remain stable and do not resolve within 24 hours is helpful in distinguishing them from hives. Such rashes may need to have a small specimen of skin removed and examined under the microscope (biopsy) to accurately determine the nature of the skin disease. If hives are making it difficult to sleep, then it may be necessary to see a physician. This would be especially important if you are taking nonprescription antihistamines. If your hives last longer than two months, it is also likely you will benefit from visiting a physician. Some family physicians or internists may feel comfortable caring for patients with chronic urticaria. Most dermatologists and allergists are able to care for patients with urticaria. Blood tests, including a complete blood count (CBC) and erythrocyte sedimentation rate (ESR, a marker of inflammation), are all that is typically recommended for evaluation. The goal of treating most cases of ordinary acute urticaria is to relieve symptoms while the condition goes away by itself. 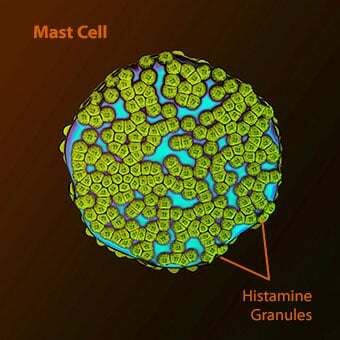 The most commonly used oral treatments are antihistamines, which help oppose the effects of the histamine leaked by mast cells. The main side effect of antihistamines is drowsiness. Many antihistamines are available without prescription, such as diphenhydramine (Benadryl), taken in doses of 25 milligrams, and chlorpheniramine (Chlor-Trimeton), taken in a dose of 4 milligrams. These can be taken up to three times a day, but because these medications can cause drowsiness, they are often taken at bedtime. Those who take them should be especially careful and be sure they are fully alert before driving or participating in other activities requiring mental concentration. Loratadine (Claritin, 10 milligrams) and fexofenadine (Allegra) are antihistamines available over the counter that are less likely to cause drowsiness (non-sedating). Also approved for over-the-counter use is hydroxyzine (Atarax, Vistaril), which causes drowsiness, and its breakdown product, cetirizine (Zyrtec, 10 milligrams), which is less sedating. Antihistamines that require a prescription include cyproheptadine (Periactin), which tends to cause drowsiness. A prescription antihistamine that causes little sedation is levocetirizine (Xyzal). Sometimes physicians combine these with other types of antihistamines called H2 blockers, such as ranitidine (Zantac) and cimetidine (Tagamet). This antihistamine list is not exhaustive. Physicians individualize treatment plans to suit specific patients and modify them depending on the clinical response. Oral steroids (prednisone, [Medrol]) can help severe cases of hives in the short term, but their usefulness is limited by the fact that many cases of hives last too long for steroid use to be continued safely. Other treatments have been used for urticaria as well, including montelukast (Singulair), ultraviolet radiation, antifungal antibiotics, agents that suppress the immune system, and tricyclic antidepressants (amitriptyline [Elavil, Endep], nortriptyline [Pamelor, Aventyl], doxepin [Sinequan, Adapin]). Evidence to support the benefit of such treatments is sparse. In ordinary cases, they are rarely needed. A new treatment now indicated for chronic urticaria is the monthly subcutaneous injection of a monoclonal antibody, omalizumab (Xolair), directed against the IgE receptor on human mast cells. Topical therapies for hives are available but are generally ineffective. They include creams and lotions which help numb nerve endings and reduce itching. Some ingredients which can accomplish this are camphor, menthol, diphenhydramine, and pramoxine. Many of these topical preparations require no prescription. Cortisone-containing creams (steroids), even strong ones requiring a prescription, are not very helpful in controlling the itch of hives. Applying cool compresses may help soothe the itch of an urticarial rash. To know exactly what kind of hives one has, or to learn more about research into the immune basis of hives or about rarer forms of this condition, consult a physician. It is important, however, to keep in mind that most cases of urticaria are annoying, not serious, and almost always temporary. American College of Allergy, Asthma & Immunology. "Epinephrine Auto-Injector." Feb. 1, 2018. <https://acaai.org/allergies/allergy-treatment/epinephrine-auto-injector>. Amrol, David J. "Chronic Urticaria Might Be a Harbinger of Other Autoimmune Diseases." J Allergy Clin Immunol May 2012. Bernstein, Jonathan A., et al. "The Diagnosis and Management of Acute and Chronic Urticaria: 2014 Update." J Allergy Clin Immunol 133.5 May 2014: 1270-1277. Criado, Paulo Ricardo. "Chronic Urticaria in Adults: State-of-the-Art in the New Millennium." An Bras Dermatol 90.1 (2015): 74-89. Fine, Lauren M., and Jonathan A. Bernstein. "Urticaria Guidelines: Consensus and Controversies in the European and American Guidelines." Curr Allergy Asthma Rep 15 (2015): 30. Kaplan, Allen P. "Chronic Spontaneous Urticaria: Pathogenesis and Treatment Considerations." Allergy Asthma Immunol Res 9.6 November 2017: 477-482. Langley, Emily W., and Joseph Gigante. "Anaphylaxis, Urticaria, and Angioedema." Pediatrics in Review 34 (2013): 247-258. Tanaka, Toshihiko, Makiko Hiragun, Michihiro Hide, and Takaaki Hiragun. "Analysis of Primary Treatment and Prognosis of Spontaneous Urticaria." Allergology International 66 (2017): 458-462.